Today is Memorial Day, a day set aside to traditionally honor and remember our war dead. I was one of the generations that was not supposed to see any war, unfortunately it did not work out that way for me and a lot of my classmates in 1965. Today we will give you a little history most people will never know. 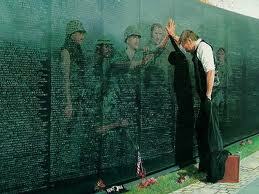 Please take a moment out of your busy day to reflect on these number and statistic’s from my war … Viet Nam. There are 58,267 names now listed on that polished black wall, including those added in 2010. The names are arranged in the order in which they were taken from us by date and within each date the names are alphabetized. It is hard to believe it is 36 years since the last casualties. I was there in 1967 some 45 years ago, the ripe old age of 19 years. There are three sets of fathers and sons on the Wall. 39,996 on the Wall were just 22 or younger. 8,283 were just 19 years old. The largest age group, 33,103 were 18 years old. 12 soldiers on the Wall were 17 years old. 5 soldiers on the Wall were 16 years old. One soldier, PFC Dan Bullock was 15 years old. 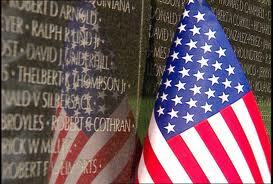 997 soldiers were killed on their first day in Vietnam … 1,448 soldiers were killed on their last day in Vietnam. 31 sets of brothers are on the Wall. Thirty one sets of parents lost two of their sons. 54 soldiers attended Thomas Edison High School in Philadelphia . I wonder why so many from one school? 8 Women are on the Wall. Nursing the wounded. 244 soldiers were awarded the Medal of Honor during the Vietnam War; 153 of them are on the Wall. Beallsville , Ohio with a population of 475 lost 6 of her sons. West Virginia had the highest casualty rate per capita in the nation. There are 711 West Virginians on the Wall. The most casualty deaths for a single day was on January 31, 1968 ~ 245 deaths. The most casualty deaths for a single month was May 1968 – 2,415 casualties were incurred. For most Americans who read this they will only see the numbers that the Vietnam War created. To those of us who survived the war, and to the families of those who did not, we see the faces, we feel the pain that these numbers created. We are, until we too pass away, haunted with these numbers, because they were our friends, fathers, husbands, wives, sons and daughters. We saw their bodies wrapped in the American Flag and shipped home. More information on the Wall can be found here.